The word root bat was prevalent in our history textbooks during our school days. Abounding with tales of conquests and betrayals it never ceased to titillate the imaginative side of our brains. “When was the Battle of Panipat fought?” – The sixth question of the history question paper would ask and a deluge of unabated tension would unleash itself upon us. At the end of the three hour academic probe we would engage in futile debates with our mates to mend our battered egos. The word root bat comes from Late Latin battre “beat”. Capoeira, a form of Brazilian combat, combines elements of dance, acrobatics and music. The combative yet fluidic style of Brazilian football can be traced back to Capoeira. 1. Abate: To moderate the intensity of something. 2. Abatement: An interruption in the amount of intensity of something. 3. Bat: To hit with. 4. Batter: Subjecting someone or something to strong attack. 5. Battered: Beaten, bruised, and broken. 6. Battering: An attack that badly injures someone. 8. Battle: A large scale fight between two armed forces. 10. Combat: To attempt to destroy. 11. Combatant: Anyone who tried to control or destroy something. 12. Combative: Someone who shows excessive willingness to fight. 13. Debatable: An indication that something may not be true or real. 14. Debate (verb): Argue about (a subject), especially in a formal manner. 15. Debate (Noun): A formal discussion on a particular matter in a public meeting. 16. Rebate: Money that is paid back. 17. Rebatable: The possibility of being partially refunded. 18. Unabated: A reference to the continuance of full strength or intensity. 19. Go to bat for (Idiom): Defend. 20. Right off the bat: Without delay. 21. Not bat an eye: to show no emotion or surprise. 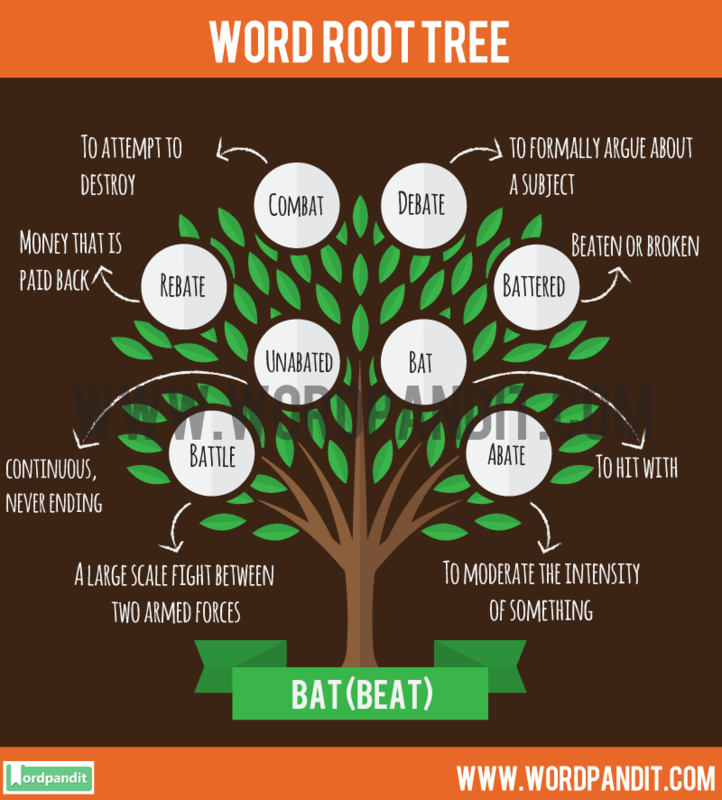 We hope this article on the commonly used Bat Root Word and it has been helpful to you in remembering the words based on the Root Word Bat and has enhanced your vocabulary.